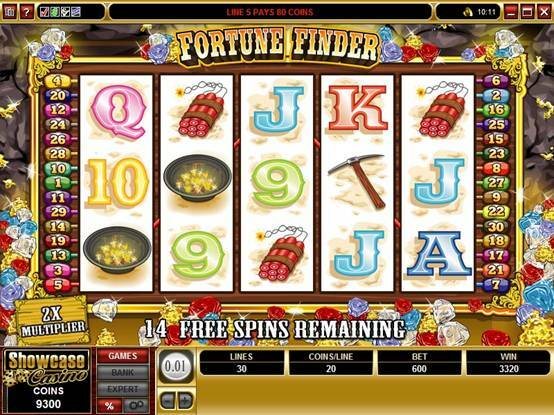 Fortune Finder Video Slot. Free Spin Feature. 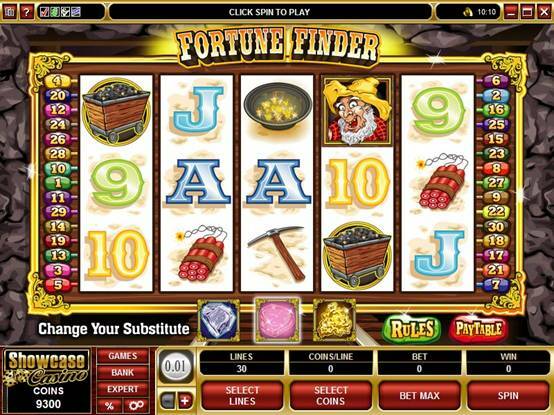 Fortune Finder Video Slot is a five-reel game based on a Mining theme with Selectable Wild and a Free Spin Feature. 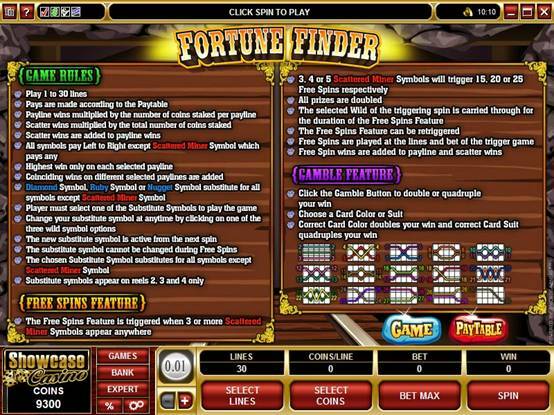 Fortune Finder is a 5 Reel, 30 Payline Video slot with a re-triggering Free Spins Feature, and a Wild Selector feature. 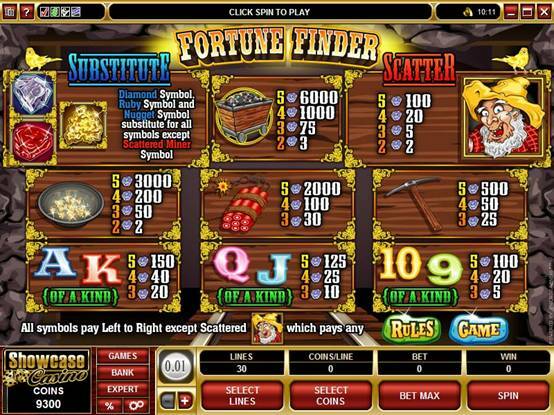 The latest new 5 reel 30 pay-line slot at Riverbelle Casino is branded FORTUNE FINDER and provides the player with a unique opportunity to choose the best Wilds with which to build those winning combinations. 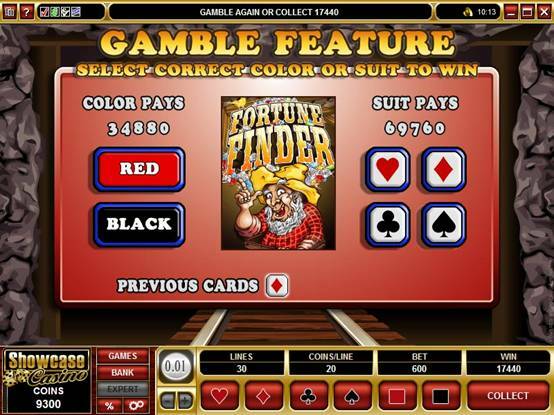 It's an interesting new element in an already exciting game that offers hours of entertainment and good reward opportunities through a heady mix of Wilds, Scatters, Free Spins with Multipliers and the ever-popular Gamble feature, where players can round off a session by predicting the color or suit of a mystery card and lose, double or quadruple their winnings. The mining theme is immediately apparent as the game opens up, with striking artwork depicting glittering gems and gold nuggets, sticks of dynamite, a pickaxe and gold panning dish....and a comical grizzled 49er of a miner! The key feature in the game is a new way to build the best combinations to maximize rewards. This is done by giving the player control of the three Wilds in the game - diamond, Ruby and Gold nugget - on reels 2, 3 and 4. The player selects the Wild he or she thinks will best deliver the right lines for the best prizes as the game moves forward. Where the chosen Wild is not delivering the goods, the player can change the selection to open up better possibilities. It's an entertaining innovation that adds a fresh dimension of suspense and excitement to the game, but note that the Wild symbol cannot be changed during Free Spins. Talking about Free Spins...there is an abundance in Fortune Finder, and the trigger is the appearance of the grizzled miner scattered across reels 3, 4 or 5. This delivers 15, 20 or 25 re-triggering Free Spins during which all wins are doubled. Ending a great game is the Gamble feature, where the player can double or quadruple wins by guessing the correct suit or color of a mystery card. Fortune Finder has a wide betting range starting as low as 0.01 and moving up to 0.25. On a maximum bet of 150.00, a total win of 30 000.00 is possible in the base game, and 60.00 000 on Free Spins. This video slot, with its Selectable Substitute feature adds an element of player smarts to the mix; try it this week at Riverbelle Casino.